The triple threat to Virginia’s Democratic leadership that has suddenly emerged in recent days — revelations of blackface photographs featuring Governor Ralph Northam and Attorney General Mark Herring, and a sexual assault allegation against Lieutenant Governor Justin Fairfax — continues to loom over Richmond like a toxic cloud. But the first glimmers are now appearing of a survival strategy that does not involve turning the governorship over to Republicans, the one “solution” the governing party is least likely to embrace. And the key figures in getting through the nightmare are likely African-American legislators and other leaders who would need to bless any “forgiveness” extended to Northam or (more likely) Herring, while leading any campaign to secure a resignation from Fairfax, who is African-American. The Black Caucus and Democratic congressional delegation reiterated their calls for the governor to step down, and the state House Democrats — who also previously called for Northam’s resignation — said they remain disappointed in him. “The attorney general has earnestly reached out to each of us to apologize and express his deep remorse,” said a statement by Virginia’s two U.S. senators and seven Democratic members of Congress. Fairfax’s fate will likely depend on subsequent investigations into the 2004 assault claim he has denied, though it’s not looking good for him as more and more Democratic leaders deem Vanessa Tyson’s account of her encounter with Fairfax credible. Meanwhile, against all odds, Northam is reportedly determined to tough it all out, despite nearly universal demands for his resignation among Democrats in Virginia and nationwide. It is possible, I suppose, that he could come up with a combination of explanations and apologies for his past behavior that would convince some Democrats to accept his remaining in office until the end of his term. But at this point, Northam’s strongest argument is simply that Donald Trump has irrevocably changed the standard for what constitutes an irredeemable scandal. That’s not going to be a terribly compelling argument for Democrats, who can’t be happy to go into a critical state election led by a governor with such baggage. The heat on Virginia Democrats was partially deflected by the fresh revelation that the state Senate’s top Republican, Tommy Norment, was an editor of a college yearbook replete with blackface and other offensive images. As my colleague Zak Cheney-Rice noted, African-Americans in Virginia and elsewhere are justified in assuming these sort of racist antics are far more widespread than had been previously admitted, and for resenting implicit and explicit demands that they save white politicians by deeming them as reformed. The odds are high that before this scandal is resolved, African-Americans and other critics of Virginia’s Democratic establishment will demand some concrete concessions in terms of both policies and leadership opportunities. Republicans are hanging on to very slim majorities in the state House of Delegates (51-49) and state Senate (21-19). 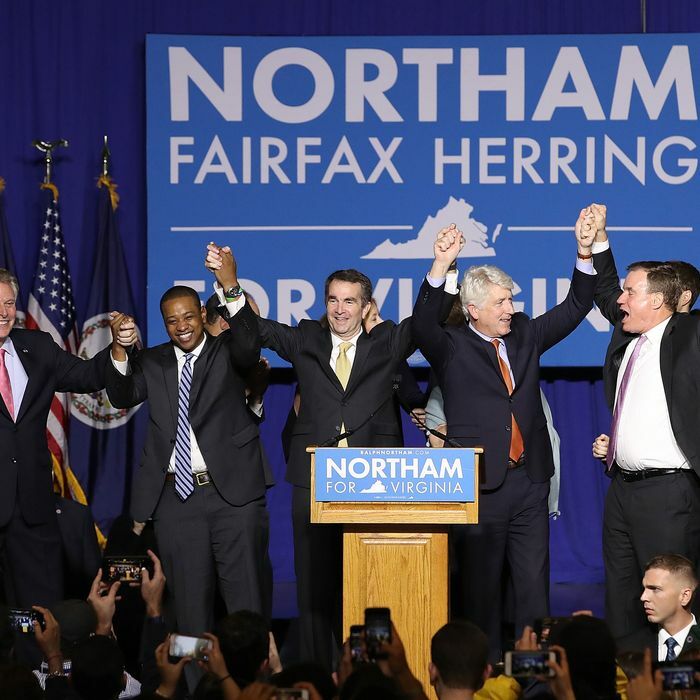 Democrats made a net 15-seat gain in the House of Delegates in November 2017 as Northam, Fairfax, and Herring won statewide. Democrats seemed like favorites to win both chambers … particularly because a new state House of Delegates map imposed by judicial order will improve Democratic odds in that chamber. This impending victory seemed to augur well for Democratic control of the post-2020 redistricting process in a state where Republicans did some pretty aggressive gerrymandering in the past. Now the scandal casts a large shadow over the election, which could include a special election for Lieutenant Governor if Fairfax resigns. And while Virginia seems to have become a relatively reliable Democratic state at the presidential level (Obama carried it twice, as did Hillary Clinton in 2016), the current chaos, and worse yet, the possibility of racially-tinged party infighting, might revive Republican dreams of carrying the state for Donald Trump. A bit further down the road, the current crisis has made a hash of Democratic plans for hanging onto the governorship for a third consecutive term in 2021 (Northam cannot run for reelection even if he hangs onto the job until the end of his term). Both Fairfax and Herring were considered certain candidates for governor that year. If, as is the most likely scenario, Herring becomes governor after Northam and Fairfax resign, he will be eligible to run for a full term in 2021, but will very likely attract primary opposition (possibly from unsuccessful 2017 candidate Tom Perriello). Any way you slice it, today’s scandals won’t go away without some additional storm and stress, and perhaps a sea change in the leadership of the Virginia Democratic Party.